Mrs. Cardinal flares as she is about to land and join Mr. Cardinal and friends for a bite of lunch during a 2011 February snowstorm. Click on the picture to see our original post with a bunch of cardinal pictures and our normally scintillating prose. You’ll know you are there when you see this picture. This week we are sending you back to a post we originally showed to the known world in February of 2011. We had a non-typical covering snow storm in LA (lower Arkansas) which made food sparse for foraging critters. We loaded up the bird feeder and immediately became very popular with the neighborhood feathered residents. I used our house as a blind and shot out the bedroom window. That meant the window was open, and the bedroom door was closed since the cats would immediately hurl themselves through the window and scatter the birds, given the tiniest of chances. Click on the bird to see our Corndancer story and pix on these birds. That also meant that our normally cozy bedroom had a temperature level like a meat locker on steroids and/or the bottom of a Klondike sinkhole, whichever came first. Fortunately I could take a break occasionally and thaw out only to return for another session. It was downright addictive. Click here to see our original February 2011 post. Also be sure and see our new, improved Corndancer Photo of the Week article with three new pix from this shoot. Annnnnd, see our gallery with all of the bird pix, most of which are a hoot, from the February 2011 bird extravaganza. 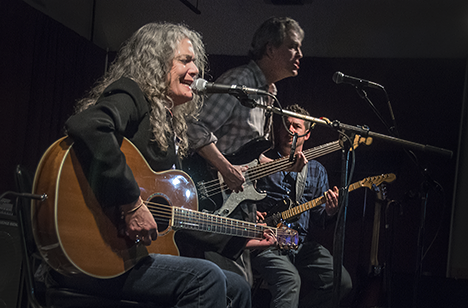 Legendary Blues maven Reba Russell belts out the Blues in a February 8, 2015 benefit for Joe Powell at Neil’s Music Room in Memphis TN. Russell batted cleanup after six other great bands did their part in the concert. 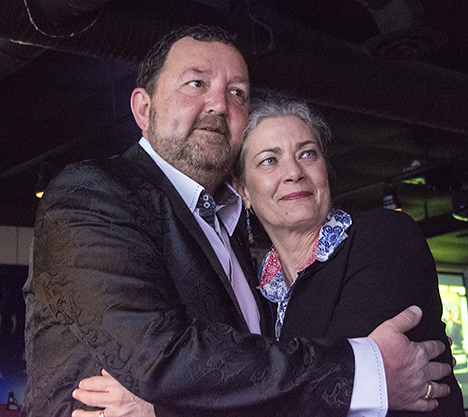 Late in 2010, blues enthusiast Joe Powell of Pine Bluff, Arkansas, hatched up an idea to sponsor a blues concert to benefit a friend who was stricken with cancer. The idea germinated a bit further to become a recurring series of concerts, each one of which would benefit a victim of cancer or another catastrophic illness. 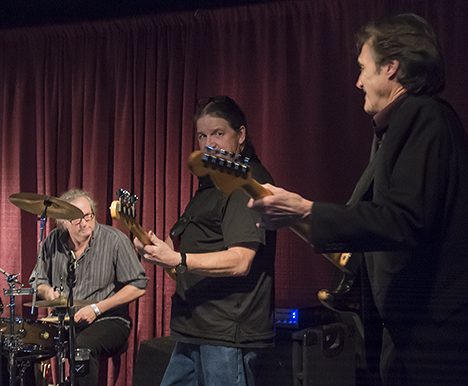 Powell and a crew of friends and sponsors, organized “Blues for a Cause, A Helping Hand,” put feet on the idea and held their first concert in March of 2011. The concerts continued and each one benefited another deserving person. All the while, Powell is the consummate volunteer in the Blues community. 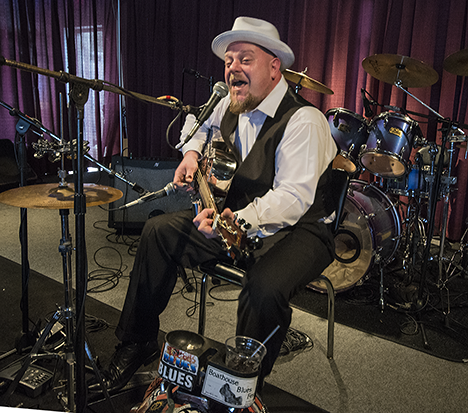 He is a member of the Blues Foundation, and participates in volunteer capacities in the Blues Music Awards, The International Blues Challenge and the legendary King Biscuit Blues Festival at Helena, Arkansas. Click the chicks for the cool pictures and story at Corndancer dot-com. 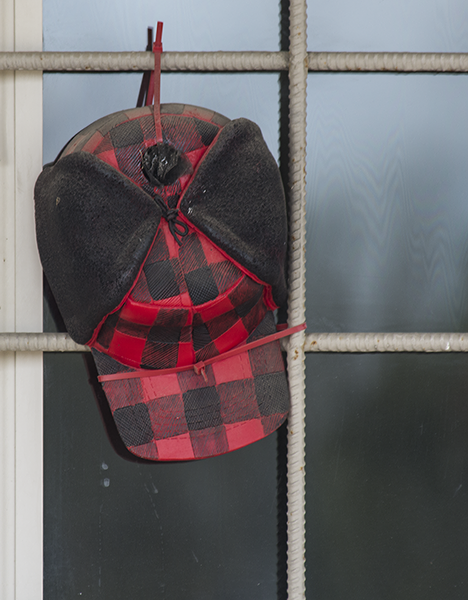 At this point in Weekly Grist articles, we normally send you to the Photo of the Week page at Corndancer dot-com for a related story. This week will be no different with one exception: the story ain’t related. However we believe you will like what you see and read about a one-legged seagull and an up close and personal visit with some free-range chickens. Fast forward to late 2014. Powell was diagnosed with cancer. He started chemo treatments which are no walk in the park. The shoe was now on the other foot. 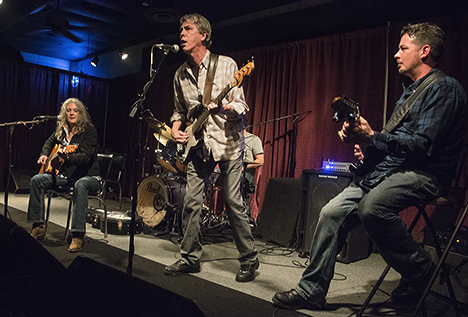 A group of Blues musicians in Memphis took notice and organized a benefit Blues event for Joe Powell, February 8, 2015 at Neil’s Music Room in Memphis. The event lasted from 2:00 p.m. through 8:00 p.m. In that time, seven great bands held forth with their finest. It was a great event with great music and an appreciative and generous crowd. 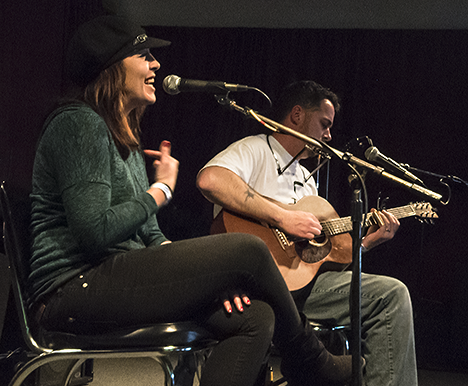 Amylee Pettis has a thousand watt smile to go with her sultry, real-blues voice. She can belt it out while her husband Lance Pettis accompanies her on the guitar. 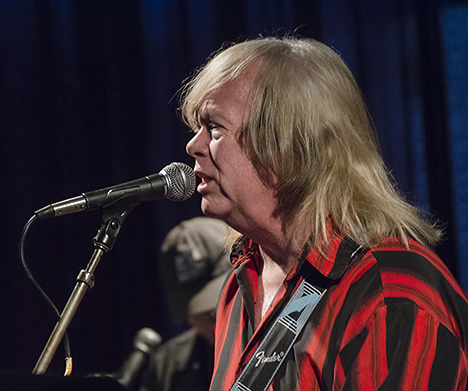 Pettis, a natural musician, puts his heart and soul into every chord he strums and every note he sings. 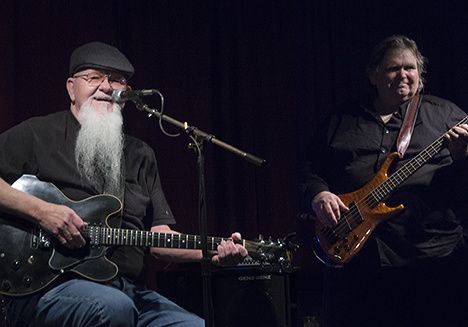 You can “hear the sweat.” The pair make Blues magic together. 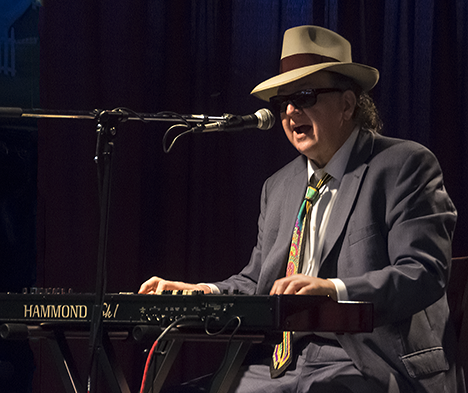 Robert “Nighthawk” Tooms pounds the ivories as part of the Wampus Cats, one of the most experienced Blues bands in Memphis. The musicians in this band have been there done that, and their Blues music speaks volumes for what they’ve done and where they’ve been. 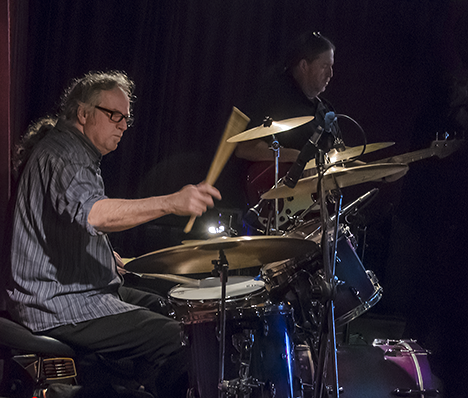 The drummer for the Wampus Cats bangs it out! The drummer eyeballs the bass player who eyeballs the guitarist and camera. Joe Powell, the honoree, and Reba Russell ham it up for a phone photographer and I steal the setup. Jack Rowell, Jr,. 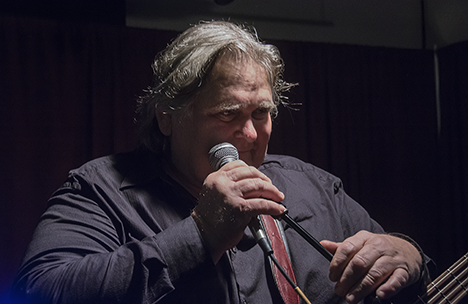 leader of the Royal Blues Band sings and plays the Blues. He’s been at it a while. A glimpse of his facebook page shows Rowell in his early teens already wailing away in a band. 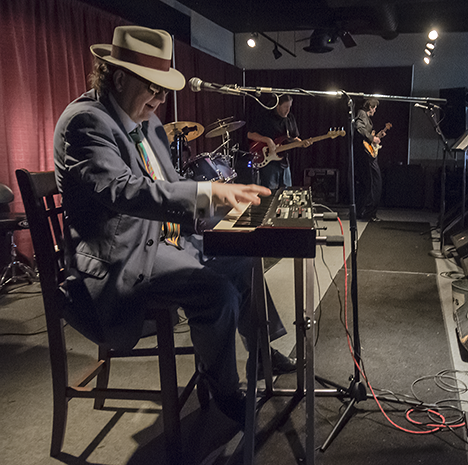 Jack Rowell, Jr., and the Royal Blues Band. Jack and this group are always involved in anything worthwhile on the music scene in Memphis. They are an experienced band. A couple of the guys were playing about the same time the Mayflower first made landfall. My friend Leo Goff, world-class bass player and blues performer. 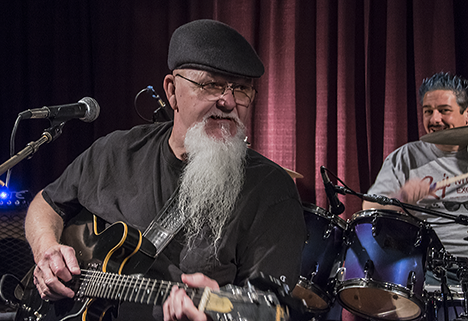 He plays with a number of bands and is always in demand for his great blues talent, knowledge and sense of humor. Don McMinn a Memphis musical veteran. Many will remember his role as the “house band” at the famous “Rum Boogie” bar on Beale Street. He was great then and better now. Two legends wail the blues. Don McMinn and Leo Goff. 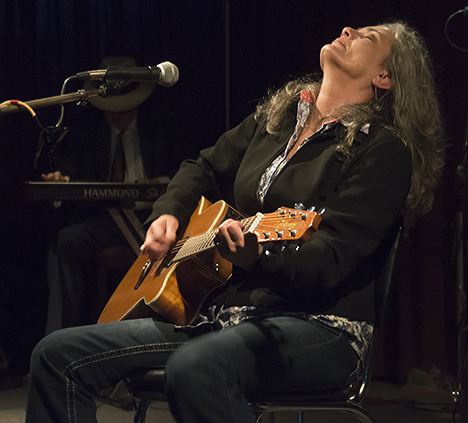 Reba Russell, Wayne Russell, and Lance Pettis are “into it.” Reba’s emotional outpouring of the Blues rattles your bones and shakes your soul. Reba, Wayne and Lance. Their last number and closing piece for the event was a highly respectable version of a Jimmy Thackery favorite. Folks, this event was living proof that Blues musicians are regular people who just happen to be the genuine messengers of one our nation’s only original art forms. And unless you are a “real person,” you ain’t gonna do the “real blues.” These people got their respective acts together in more ways than one to help a friend. On top of everything else, I can personally attest to Joe Powell being one of the good guys. His children are my grandchildren. Click the pic for the “rest of the story” and more pictures from Elaine. Their decision is not an accident. They were looking for a way to engage the young people of their town in a wholesome and fulfilling activity. During a meeting of volunteers exploring the possibilities for such an activity, the idea came up and initially brought a few laughs including a chuckle or two from the originator, Pat Kienzel, an Elaine volunteer and school counselor from Fayetteville, Arkansas. Later, laughs aside, after some more thinking, Kienzel and the group decided that was the way to go. 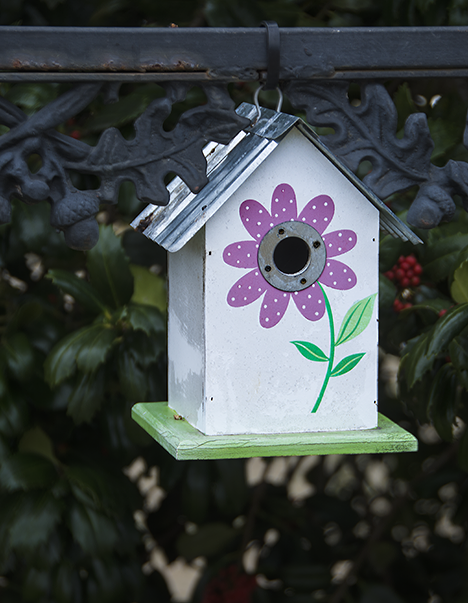 Find out more about how the birdhouse idea germinated and came to fruition on the Photo of the Week page at Corndancer dot-com where this story started. 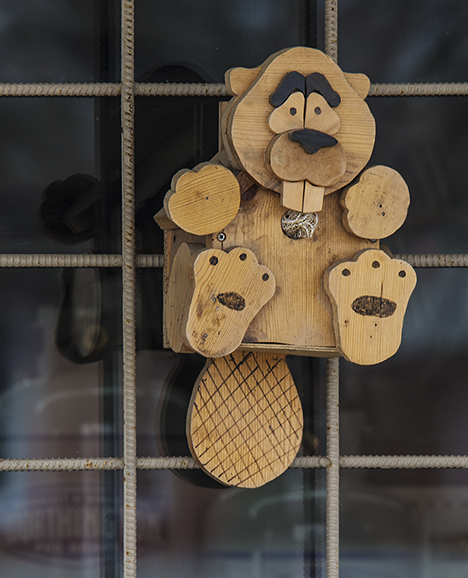 We’ll wait here for your return. 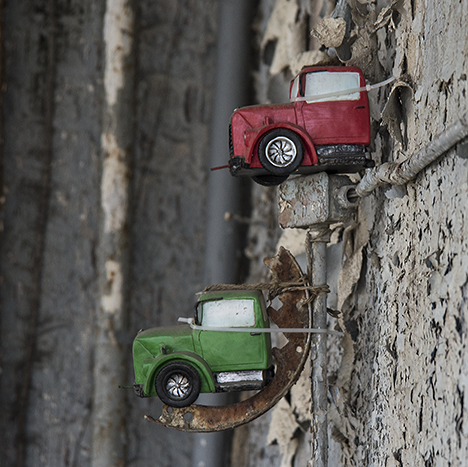 At the top of the “I didn’t expect to see this list” are two truck bird houses attached to the walls of an old service station in Elaine. 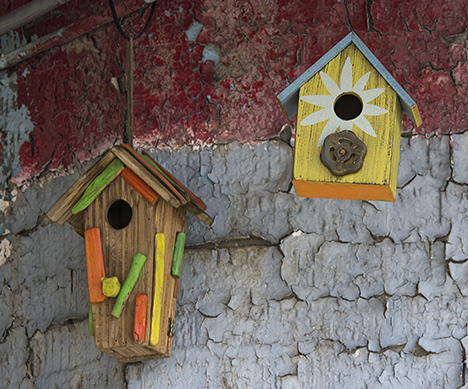 Just around the corner from the trucks are these more traditional birdhouses. 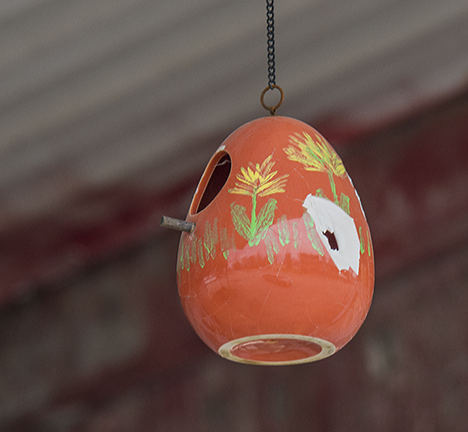 One more birdhouse at the old service station. The next four birdhouses live in shrubs behind the “Elaine Arkansas” sign on the north side of the town on Arkansas State Highway 44. See the sign at Corndancer dot-com. 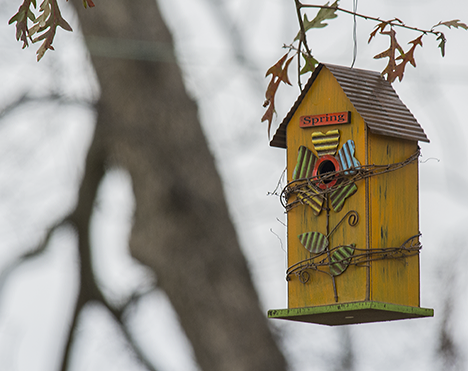 This birdhouse greets travelers as they come to Elaine from the north on Arkansas Highway 44. Striped chicken-bucket like birdhouse, ditto on the location. 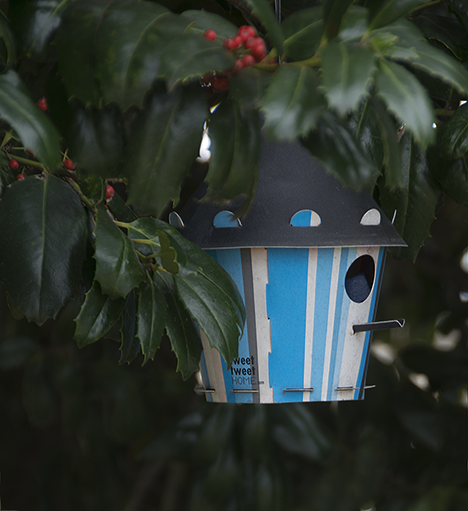 A Miami looking birdhouse in Elaine, ditto on the exact location. 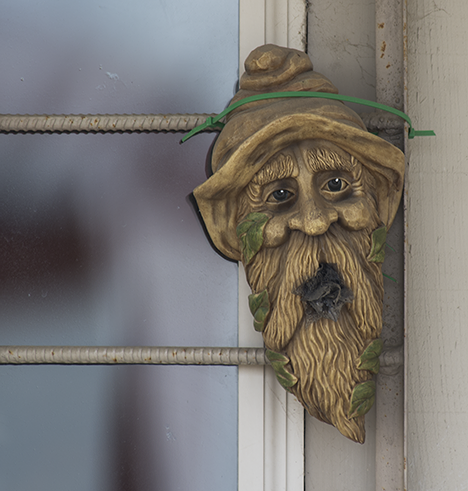 An old-codger birdhouse at Gary Carpenter’s Delta Hardware in Elaine. 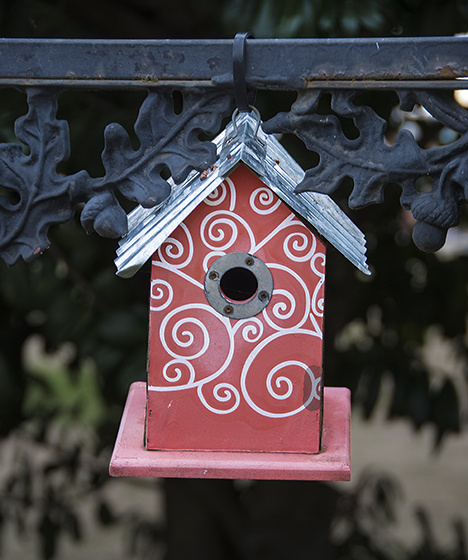 Another birdhouse from Delta Hardware. This time it’s a Floyd R. Turbo model. 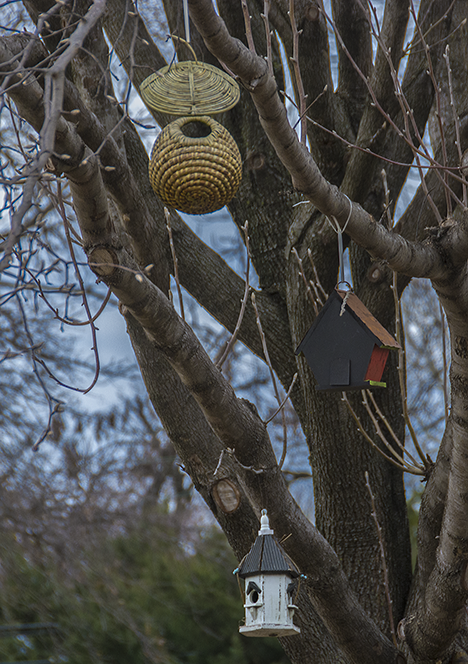 Three neat birdhouses grace this Elaine tree. 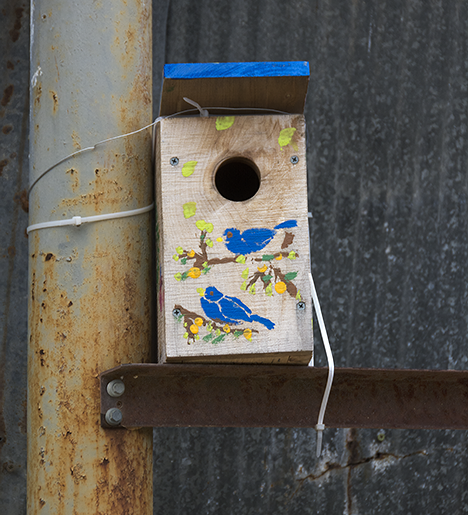 Dig this yellow high-rise birdhouse with vine decor. 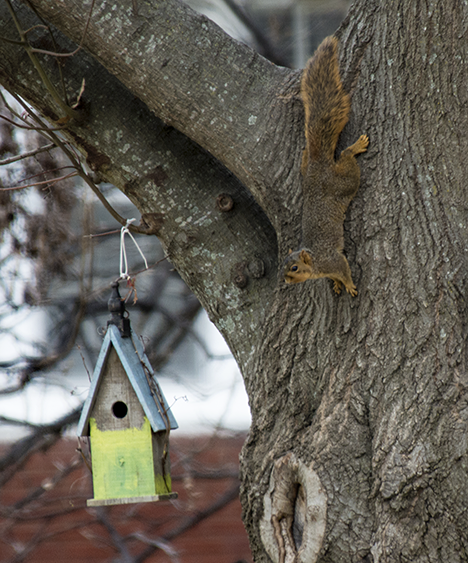 A curious fox squirrel checks out a birdhouse. 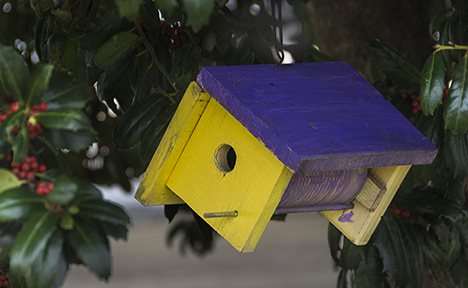 The Elaine birdhouse team puts ’em anywhere. 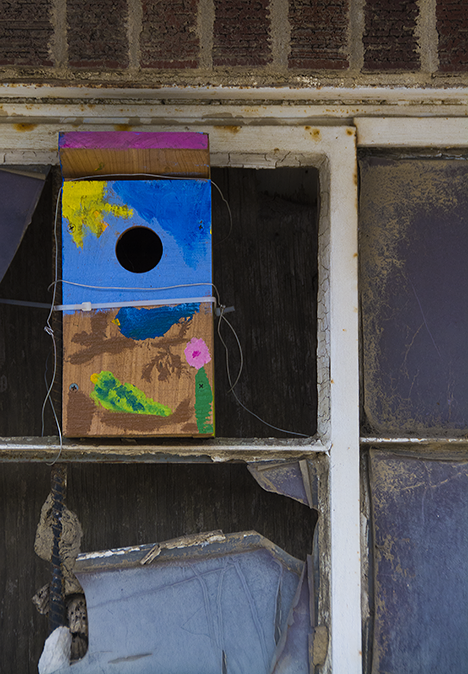 When they find an ugly corner in Elaine, the emergency birdhouse crew installs a remediation birdhouse. You gotta love what they’re doing in Elaine. We believe it’s going to get even better. It will be fun to watch. See all 59 pictures we shot on this trip to Elaine in our America’s Bird Capital gallery.